Looking at modern communications and the way that television pictures can be transmitted almost instantaneously anywhere in the world, it is worth remembering that the man who invented television was John Logie Baird who was born in Helensburgh in 1880. Also worth remembering is that the inventor of the telephone was Alexander Graham Bell born in Edinburgh in 1847. These two famous Scots had a clear impact upon the whole world and they way in which it developed. But were there other Scots who had such a dramatic impact? One has to mention David Hume, born in Edinburgh in 1711, and generally regarded as the most important philosopher ever to write in English. Should we should cite Alexander Fleming, born in Darvel in 1881, as the father of modern antibiotics having been awarded the Nobel Prize for the discovery of penicillin? Perhaps James Young Simpson, born in Bathgate in 1811 for his discovery of anaesthetics? We could mention Adam Smith, born in Kirkcaldy in 1723, as the father of modern economics. We also have to consider James Watt, born in Greenock in 1736, for his invention of the steam engine or one of his direct descendants Robert Alexander Watson-Watt, born in Brechin in 1892, for his invention of radar. We could talk about John MacAdam from Ayr who discovered the ideal road surface materials or John Boyd Dunlop, of Dreghorn for his invention of motor car tyres. We could mention John Chalmers of Dundee who invented adhesive postage stamps. Other famous Scots include John Witherspoon, a presbyterian minister from Paisley who became the father of the American educational systems; William Patterson of Dumfries who founded the Bank of England; John Paul Jones of Kirkbean who founded the US Navy; John MacDonald as the first Prime Minister of Canada; John Muir the pioneer of modern conservation programmes; ……and the list goes on! Is it not surprising that Scotland, considered to be western Europe’s poorest country, and with such a small population, should have such a dramatic impact upon the rest of the world? To understand how that came about it is necessary to look back at Scottish history and to realise that Scotland was the first European country to achieve general literacy among its population. This came about when the Scottish Parliament introduced an “Act for Setting Schools” in 1696. The political force behind this act was the Kirk, where the aim was to bring the written scriptures to the population as a whole. As a direct consequence of the 1696 Act, it became a legal requirement for each Parish in Scotland to establish a school and to pay the salaries of teachers. Education for the general public was provided free of charge. By 1750 it was estimated that more than 75% of the Scottish population was literate, and there were lending libraries in every moderate sized town. It was not until the late 1880s that England managed to achieve a similar level of literacy. Consider Robert Burns, born on 25th January, 1759. He was the son of a poor tenant farmer and grew up in rural Ayrshire. While the majority of people living in farming communities throughout Europe were largely illiterate, the working classes in Scotland, including Burns, had access to education. He studied Latin and French and excelled as a student. By the age of 16 years, Burns was an avid reader and had read extensively some of the more prominent writers of English literature. He studied Robert Boyle’s lectures on chemistry, other volumes on history and geography, plus texts written by leading philosophers of the day. It is also fascinating to realise that, during the 18th Century, Scottish universities were streets ahead of their English counterparts. Again this was attributable to the influence of the church. This time it was the Anglican Church, which imposed entry qualifications to Oxford and Cambridge universities. Only persons of the Anglican faith were permitted to attend Oxford and Cambridge, which narrowed the intellectual scope of their respective student bodies dramatically. By contrast, Scottish universities had no such restrictions and attracted scholars from all over Europe. Herman’s book provides a convincing and compelling case for his assertion that the Scots created the modern civilized values America and the Western world uphold. Ask yourselves this question. Who invented our modern ideas of democracy? 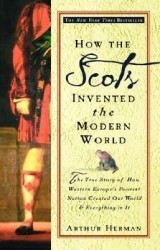 It was the Scots! If you compare the model of church governance adopted by the Scottish Presbyterian Church in the 17th century, to modern democratic processes you will see striking similarities. Much of the language and aspirations contained in the American Declaration of Independence of July 4, 1776 is widely acknowledged to carry the distinctive stamp of Scottish Presbyterianism, with twenty-one of the signatories being of Scots descent. So read Herman’s book and discover a wealth of information about Scotland’s history and some of the most influential Scots who’s combined intellectual skills and abilities have shaped the world as we know it. Then the next time any of you get any stick about having a Scot’s burr or coming from “Och Aye the Noo Land” you can dazzle them with an array of historical facts that demonstrate How the Scots Invented the Modern World.